"Analyze data from tests to determine similarities and differences among several design solutions to identify the best characteristics of each that can be combined into a new solution to better meet the criteria for success." To model this standard, I plan on sharing what I did with my SolSource when the adjusting rod broke. Initially, I was going to hack up an adjustable hiking pole and use that...but I looked at my Kickstarter "SunJuicer" and thought about the simplicity of their rotation mechanism. On the sun juicer, a single piece of string is routed through the design in such a way that by pulling the string, you can rotate the dish about the X-axis (pitch rotation) -- however, to hold tension, you just wedge the line in a slot in the wood. That doesn't seem to be a very reliable way to secure the line. 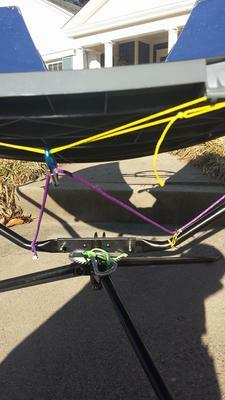 I looked at both designs and brought my knowledge of knots from hammocking into play. What if I used the line system from the SunJuicer and secured the line with a prusik hitch that I use to hold my tarp in place when I camp? I now have a system that I think is better than the adjusting rod of the original SolSource. 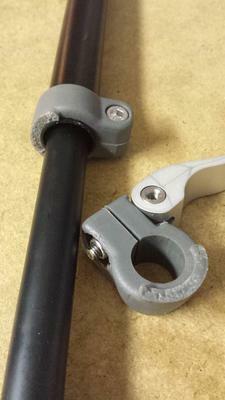 It is cheaper,smoother and more simple than the really wonky adjusting rod on the SolSource. I've said it before, and I'll say it again. The SolSource is incredible. Its achilles heel is that adjusting rod. They might have changed it after customer feedback. 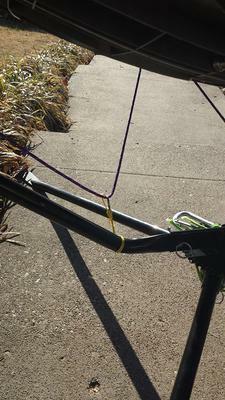 It might give a better idea of how the line tensioning system works. Yes! I forgot to mention that. I have had to put the legs up on rocks or books when the sun is at an extreme angle because I could not get full tilt with that arm in the way. Obviously I'm biased, but I would highly suggest that SolSource users at least try this mod. It is cheap, doesn't take long and seems to be an improvement in functionality. Great job on coming up with an alternative (and better elevating system)to the tension rod. I did not think that the tension rod was a good feature on the solsource either. The tension rod was not only weak, but it prevented one from getting maximum elevation of the parabola as well because it "blocked" the parabola at a certain height. I really like your solution to the tension rod.